Buckeye Valley’s Max Stokey grabs a rebound during a game against Delaware Hayes last season. 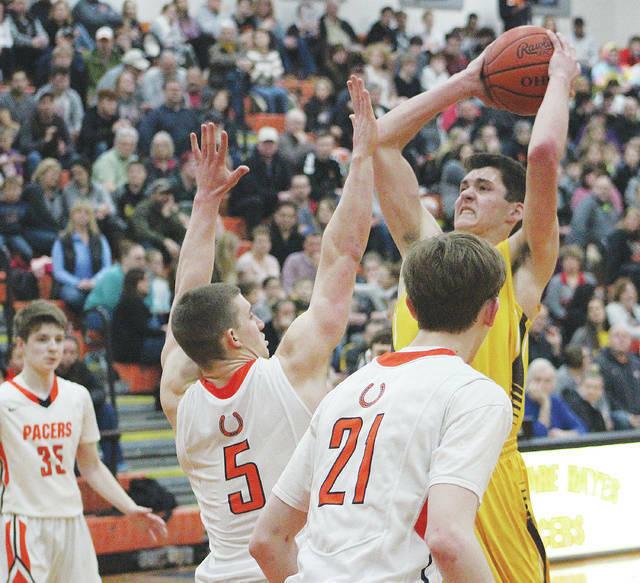 Depth, more specifically the lack thereof, has been an issue for Buckeye Valley in recent seasons. It’s played a role in back-to-back 7-16 seasons, that after an 18-7 campaign in 2015-2016. This winter, though, BV head coach Andy Gast said depth could very well be a strength for the first time in a handful of seasons. Key returners include senior Luke Lucas and juniors Dylan Herbert, Max Stokey and Clark Newland. Herbert, who averaged 17 points and three assists per game, was named first-team All-MOAC, second-team All-District and Honorable Mention All-Ohio last season. Stokey, meanwhile, averaged six points and six boards, Newland averaged nine points and six rebounds and Lucas is back as one of just two seniors on the team. “Luke has great leadership skills and will for sure be one of our captains,” Gast said. “His leadership will be very important for our team this season. He’s also a great three-point shooter when his feet are set and is also a great defender. Key newcomers include sophomore Jack Rotondo, Troy Scowden and Dylan Thompson. “Troy is probably one of the more talented kids we have had in our program at his age,” Gast said. “He is long (6-foot-6) and athletic and can play inside and on the perimeter. Others expected to make key contributions included senior Stone Foltz, sophomore Jake Radcliffe and freshman Jevin Beard. The Barons are deeper. But, they’re still pretty young. That youth means the team will need to figure things out on the fly early on. The players will need to figure out their roles quickly, too, as the MOAC won’t provide any easy wins. “Our league will be very strong from top to bottom,” Gast said. “Pleasant, which won the league last season, returns the majority of its team. I would say they are the favorite, but Ontario, Shelby, Clear Fork and Marion Harding will also be very good. Buckeye Valley opens the season Friday against visiting Delaware Hayes. Tip is set for 7:30 p.m. and, due to the limited number of seats available, the schools will be selling pre-sale tickets only. BV will be selling tickets to its students and fans at the high school between 7:45 a.m. and 3:00 p.m.
Tickets ($7 for adults and $5 for students) are on a first-come, first-serve basis and will be available at BV until they are sold out.